SCOTLAND – Where to Go and What to See! I get a _lot_ of mail and messages from people saying that they’re planning a trip to Scotland—where should they go, and what should they see? Well…there’s a _lot_ of Scotland to see, but what you see and with whom might vary a lot. I thought I’d do various posts this month (and probably some of next) about different ways to visit Scotland, and Things You Might Like to See. The first choice is perhaps: go solo, or with a tour? Scotland is an extremely tourist-friendly country, and it’s not at all difficult to get around and see an enormous amount by yourself. On the other hand, going places with a guide or a group can offer you a lot, too: less risk of getting lost , good company, decent meals, comfortable and efficient travel, and a fair amount of fascinating information about what you’re looking at. Several of these guides are listed on my website (they’re under the tab labeled “Resources”). Some of these operators have recently updated their material, and I have a couple of new ones to add. I thought I’d introduce them to you, and as we go on, add information on specific places (such as Castle Leod) that you might like to go either with a tour/guide or if traveling alone. Let’s start with Lord Jamie Sempill, who is now working in conjunction with Alistair Cunningham’s ClansandCastles group (this is on the webpage), but is offering his own specialized tour dealing with the life, times, and places of Mary, Queen of Scots. See below for Jamie’s account of his first tour, and his contact details! The Inaugural Mary Queen of Scots tour. The inaugural tour was a great success, with the notable exception of the weather, which decided in memory of Mary to replicate her arrival in Leith some 450 years ago. Grey, misty and wet. In fact, so bad were the conditions that we arrived at Edinburgh Castle to find it closed on account of the conditions. Fortunately, the Museum of Scotland is close by, and provides a wonderful insight into her reign plus allowing sufficient time for the Castle to re-open. Bad weather, however, is good for team spirit, and adds to the sense of adventure. So by the time we toured Holyrood Palace and had been told the tale of Rizzio’s bloody murder, the dark rain filled sky had provided the perfect backdrop. The following day saw us in the Borders, where the dreak [DG - that’s how it’s pronounced; you usually see it spelled “dreich”.] weather had decided to park itself for the day. The Mary Queen of Scots House in Jedburgh is a real gem. It is dedicated to her memory and has been open to the public since 1930. One of the rooms has painted panels of all the key players in her reign, which helps in putting faces to the names which crop up throughout the tour. It is also a great example of a 16th century tower house, which stands as a good contrast to the castles and palaces where she lived. It is incredible to think that during her very short reign she travelled over 1200 miles and stayed in 80 different properties. One of which, Traquair House, was our lunch time destination. This house is still lived in by the Maxwell-Stuarts, whose ancestor was the Captain of Queen Mary’s Royal Guard. The group, by now enjoying a rapidly clearing sky, was met by Catherine, the current Mistress of Traquair. It is Scotland’s oldest inhabited house and boasts its own brewery and chapel. Craigmillar Castle sits on the outskirts of Edinburgh in a district known as Petit France, on account of the number of French who lived in the area at the time of her reign. It was here that a group of her advisors decided that Darnley, by now a major political embarrassment, had to be removed. The Craigmillar bond is said to have been agreed to by Mary, but the document has never been found. The castle is a well maintained ruin and has a great view of both the city and the coastline. It is also very close to the Sheep’s Heid , Scotland’s oldest inn, and the perfect place to end the second day. The final day started with a 10 minute boat trip on one of the country’s largest bird sanctuaries. We were blessed with clear blue skies and no wind. Loch Leven is probably more closely associated with Mary, than all the other properties bar Holyrood. She was held captive here for nearly a year during which time she had a miscarriage and was forced to abdicate her throne. Falkland Palace is by contrast a far more inviting location. We had the great advantage of being guided by Lindsey Fowell, a member of the Marie Stuart Society. She was dressed as Mary and plays the role to perfection. The chapel is very special, and is still open to the local community. 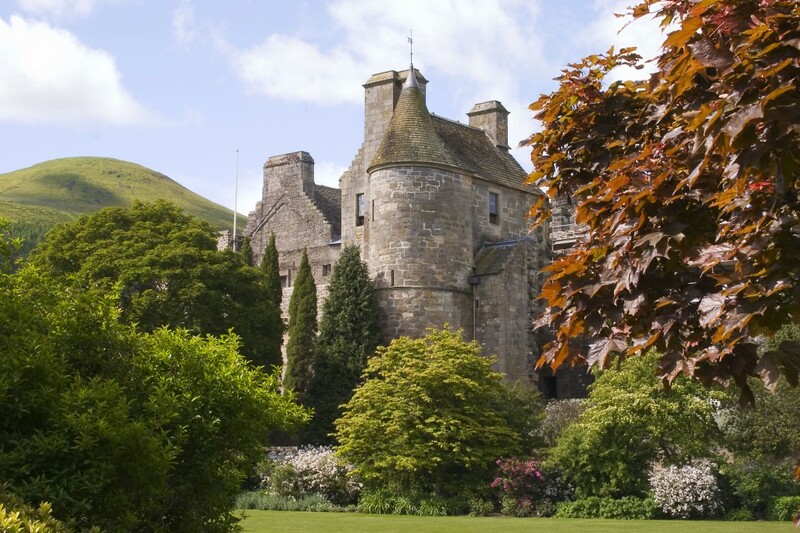 The palace also has the advantage of being well looked after and is still lived in by the Crichton-Stuart family, the hereditary Keepers of Falkland Palace. The group’s last visit was to Stirling Castle, which recently won the award for the most popular tourist destination in Scotland. The restoration of the castle by Historic Scotland has been a major achievement and is very much the icing on the cake as far as the tour is concerned. The great advantage is that the restoration takes us back to what it would have looked like during her reign. This helps to show the power of the Stuarts and the impact of the renaissance on Scotland, all of which is greatly enhanced by the performance of the guides dressed in contemporary costume. They are a real tour de force. Over dinner that evening, which I hosted in my home, it was quite apparent that the tour had been a great success. Importantly, it had been entertaining whilst informative. One of the group, Pauline, who lives on the isle of Skye, had really enjoyed seeing a part of Scotland that she had only ever driven through. I believe that key to the success of the tour had been how well the group had enjoyed each other’s company. It was the first time I had run the tour, and I really enjoyed it. The fact that my family had had been party to many of the events that occurred during her reign, enabled me to provide a personal view, albeit with a small touch of poetic licence! So if you are interested in knowing more about sixteenth century Scotland and the reign of Mary Queen of Scots, call at www.clansandcastles.com/mqs, where you will find all the appropriate information about the tour. I wonder how much of Scotland’s tourist industry is due to your influence? I doubt I would have had any desire to go before reading your books. I’ve had just a taste of the country from port stops on a cruise, but I’d love to go back and take my time there. Thank you, Diana, for providing us with travel ideas. I have to agree, I went to Scotland with my daughter for college grad. because we both got into your books big time and found out we have Scottish heritage-way up north in Thurso and Caithness area. It was all I dreamed, and you also gave me a knack for growing and harvesting herbs both medicinal and kitchen use. Thanks for all the learning you spurred me on to do because of all the interesting subjects you weave into you stories! Thank you! Your post was a gift today, as today is my 50th birthday and my husband and I are planning a trip to Scotland for our 30th wedding anniversary! I’ve been researching like crazy but it’s been a bit daunting as we don’t travel much. Both my husband and I are avid fans of yours. We are looking forward to the adventure and romance of a real trip to Scotland! Thank you, My dream is to visit Scotland and having traveled much as a kid with my mom I have not traveled much since. I would feel more comfortable with a group as I would travel by myself, husband is deathly afraid of flying and does not travel unless by car and Scotland is a bit of a long and wet drive. I hope to be able to make this trip someday and your recommendations will be very helpful. I introduced a couple of my co-workers to DG’s books. One day I mentioned that I would love to go to Scotland. So we booked a tour that hit some of the places mentioned in Outlander. Scotland was wonderful. It’s beautiful, the people are friendly and we absolutely loved it. I had never traveled much either so booking a tour made us feel more comfortable. But after we got there, we realized we could have made our own arrangements. Either way, you’ll have a great time. By the way, while waiting for a ferry on the Isle of Skye, we saw the actor Kevin McKidd. He plays Dr. Owen Hunt on Grey’s Anatomy. He was visiting his family there. He was very friendly and we chatted with him and he posed for pictures with our group. My father played the pipes in competition and when he would practice in the house (just before the competions he’d bring out the whole kit) the glass in the windows would shake! I’m saving these posts in a file, along with a map and a time line to try to figure out where to go and how long to stay. These posts of yours are going to be very helpful indeed. Thank you for the tips! I hope to go one day, when my husband stops rolling his eyes about the mention of Scotland & Outlander in the same breath. I was re-reading ECHO, last week, (with the dust cover removed! ), and he said: Is that a new one, or are you caught up again? On “dreak” weather, we had an extremely rainy, drizzly week here in GA, and I began to call it the UK of GA – and imagine tromping around & riding horses in this weather. Wow. New thoughts on the fortitude of our forbears! last spring my husband and I visited Scotland. We hired a car and did a tour from Edingbourgh to Fort William, the Isles of Skye, Inverness and Perth. In each town we rented a little room in an Hostel and started our daily trips. We were very lucky with the weather. 9 days of sunshine (even the scottish people were astonished). Each day we did long walks through the tremendious Glens and climbed various hills, visited a few castles, the battlefield of Culloden, the distillery of Glenmorangie …, and enjoyed the kindness and friendliness of the people. We had a wonderful time and were very sorry when we had to leave. But: we´ll be back. Our advice for each traveller: the best time to travel is late May/early June (a lot of sunshine, no midges). Never been to Scotland, for this is my wish to go someday. After reading this series I feel that I was in Scotland with Jaime and Claire. I can almost picture the place and now I really want to take in all those scene in person. Thanks for posting up the sights. Thank you Diana, for some of the most interesting fiction I have read in years! I have had the honor of listening to all 7 of your books, which were narrated by Davina Porter. She has been able to express your work wonderfully! I have the faces of each character in my minds eye, and Davina assists with the personalities, the accents, and expressions of the time so well. My family, Harkness, came from Scotland through Ireland, and they settled in the North Carolina. I grew up in Defiance, Ohio and went to Anthony Wayne Elementary and we studied a lot of the history of the battle. I had no idea what direction your books would lead, and I am loving every path so far!! Thank you so much for a great series, and I look forward to the next one. Your research has been fascinating and I appreciate all you have done for us. Keep up the great work and keep on writing!! We need history presented more in this fashion. I am visual and love to learn, and I can picture it all!!! I have always had an interest because of my grandmother – Mary McRae of the Thousand Islands. Her grandfather was from Scotland and settled to farming on an island in the Thousand Islands. I am told that my grandmother was disinherited for marrying a Jones who was either a ‘damnable Welchman, or a double-damned Englishman.’ However, since reading the Outlander series I have had even more of an interest. I also want to see Ireland – the family history suggests that my great-great grandfather came from somewhere in County Cork. I can hardly wait for the next book in the series! I’ve spent up to 3 weeks in Scotland in September (as a self-driving tourist -I HAD been there before during the summer dims ‘waaay back when) and had only one dreich day and it didn’t even produce real rain. Started out from the standing stones in the English south at Avebury and headed north thru the midlands glorious and it might as well have been springtime. Never count on UK weather and all will be well! My husband and I went to Scotland in 2011 for our honeymoon. We went through Go Ahead Tours and were lucky to be there for the Military Tattoo during the Edinburgh Festival. Amazing 12 days. Talking about returning to Oban this summer for a week. We became friends with our coach driver on our trip, and he’s encouraging us to come back for a visit. I thoroughly enjoyed reading your series prior to going because it made some of the historical sights more special. We visited Scotland at the end of our European honeymoon just this past November. I was so awed to stay at Culloden House – they even have, framed in the entranceway, Charlie’s own tartan bed-hangings. It was a really amazing way to connect with history (AND Outlander, of course). I often see people writing about how wonderful their trip was, and I am so looking forward to ours in late April. But as I am a novice adventurer, I wondered if there were any tips or advice that seasoned travelers would share with this novice. I have so many questions, but don’t know who to ask or where to find the information. Were there items you should have taken, items you did not need? How do I charge an iPhone while in Scotland? Has anyone ever put together a Tips & Tricks list for Scotland trips? Thanks so much. Of course you know that the music of Loreena McKennitt will have to be used in any TV or Movie series! It’s like she’s been writing along with your books. Getting ready to read the Drums of Autumn. While on a trip to Scotland I realized how little I knew about the country, but loved every minutes of the visit. After I returned to the US, I thought, hmmm, how to learn more Scottish history without reading some dry old history book. Then I remembered a paperback novel I had picked up and thumbed through several times at Powell’s Books in Portland. It was your first novel, and of course, I realized that with each novel set in Scotland, I learned tons while having great entertainment. By the way, I have read all your novels by now, and my neighbor across the street who read all my copies, came over one day two years later and read through all of them again! 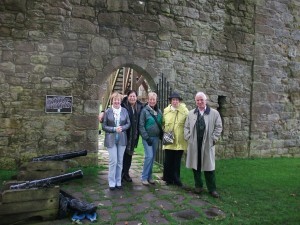 Thanks for the information on Outlander tours. I’m not sure if it was with Inverness Tours, but I was fortunate enough during a stay in Inverness in 2000, , to stumble on a sign for a small group, day tour leaving shortly. I immediately signed up and enjoyed a memorable day with a wonderful young kilted guide named, as I recall, Duncan Fraser. He made us cry at Culloden, and at Clava Cairns, he “hid” in the trees and played a haunting melody on his flute which brought chills. His highly personalized tales of historical events were entertaining AND informative. All in all, it was certainly the best “tour” I’ve ever taken. I’ve thought about him often, and wondered if he’s still conducting tours, or whether he achieved his aim of earning enough to buy the farm where his father was tenant..
My family enjoyed a day long tour with Hugh Allison in Inverness last August. It was the highlight of my trip to Scotland. He is so knowledgeable on Scotish history — as well as the Outlander series. He also wore a kilt!! He took us to places we would have never discovered on our own. I would HIGHLY recommend him and Inverness Tours. He also is an excellent writer himself and an expert on Culloden. I am a great fan of the Outlander Books. I am Scottish and looking forward to the TV series. 2014 is the 700th anniversary of The Battle of Bannockburn when King Robert The Bruce beat the English Army and succeeded in claiming independence for Scotland from England.